Discover radiance with our exclusive collection of Cushion cut diamond engagement rings. Styled with eternal beauty, each design is hand-crafted in a choice of precious metals with a varied selection of Cushion cut setting styles available. Cushion cut engagement rings feature the eternal beauty of a classic diamond shape merging the essence of the round and Princess. 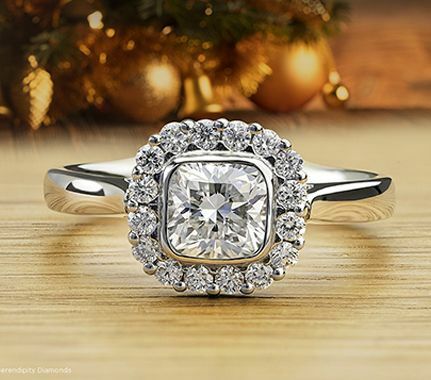 The cushion cut diamond reveals softly rounded corners, applied to a square shaped diamond. Prized in antiquity, the Cushion cut engagement ring is a connoisseurs choice. We have a varied selection of Cushion cut solitaire engagement rings, in addition to Cushion halo engagement rings. Our Cushion solitaire diamond rings feature wedding ring friendly settings, giving a perfect fit between the engagement ring and wedding band. View some of our commission photographs including the dazzling Eclipse halo ring design shown in our gallery selection. Just one Cushion ring design available from Serendipity Diamonds.